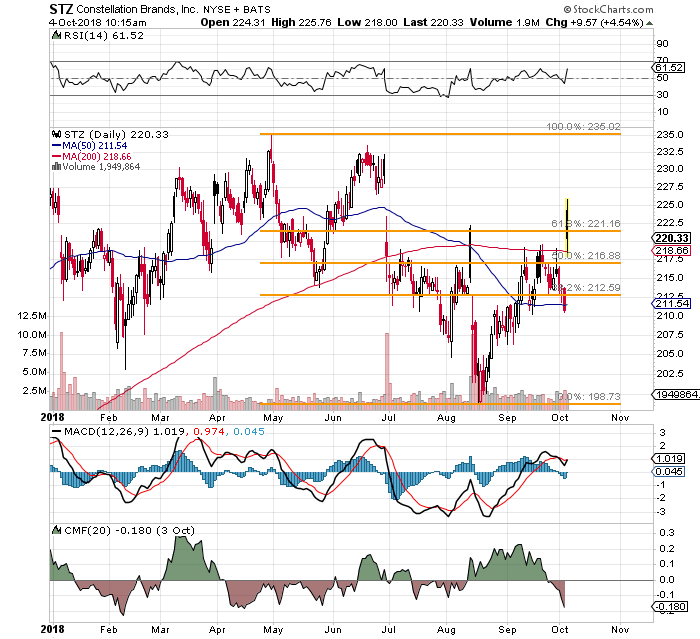 STZ is executing the core business extremely well. Years ago, back in the days of open outcry market model, I spent some time in the Constellation Brands (STZ - Get Report) crowd. Nobody called this firm by it's corporate name back then. You have heard many of the famous nicknames that crossed over from the trading community to the mainstream... "Burgers" for McDonald's (MCD - Get Report) comes immediately to mind, "Hot Shoppes" for the old Marriott Corp., "Green Beanie" for the old Burlington Northern Railroad. Constellation traded in the neighborhood of $20 back then, and did not really attract all that much attention. Constellation was simply called Starz, or on a slow day "Star Child". No idea where that one came from... but I have heard it. This morning, the firm went to the tape with their Q2 digits. They did not just beat earnings expectations, they roasted consensus by 27 cents. Revenue showed 10% year over year growth, which is solid. It was not just the beats though. It was the guidance. Constellation expects to see operating cash flow for the fiscal year at $2.35 billion to $2.55 billion. That would be up from $2.05 billion over the trailing 12 months. Free Cash Flow should now print in between $1.2 billion to $1.3 billion. What does this do? The firm now looks forward to full year EPS of $9.60 to $9.75. Consensus had been as low as $9.30 until recently, though it had become apparent that expectations were going to have to be revised upward. When everyone hears about Constellation Brands these days. they automatically think of the firm's $4 billion investment in Canopy Growth (CGC - Get Report) , which lands the firm smack in the middle of the latest growth story, that being legal cannabis and CBD infused beverages. This, however is not what carried the day in the second quarter. Beer shipment volume, led by the Corona and Modelo brands, saw an impressive 8.7% increase. This volume, in turn, ran with an operating margin of 41.3%. Dang. A new record. The negative? While there is no doubt about the firm's increasing sales and operating income, this firm still plays the game with a ton of debt. The vast majority of that debt is of the long-term variety versus a moderate amount of cash on hand. They will have to service this debt. The firm runs with a Current Ratio that suggests paying the bills is no problem, the caveat would be that this business requires the building and storage of large amounts of inventory, which compresses a firm's Quick Ratio. The firm is executing the core business extremely well, and obviously has a somewhat visionary take on the future. I have no problem blessing an investment in this name (but not at these prices) with the appropriate steps taken toward risk management. You can see here that the name failed at this level back in early August. Even though today's pop pierced the level sharply, the level needs to prove itself as support, which it has not yet done. 1) A trader can wait until the euphoric response to these earnings cools off. $212 looks like a favorable entry point. This trade will have the net effect of reducing the trader's basis to $214.81. Now, doesn't that sound better? ... and it's a whole lot closer to where I think I want to buy these.